Computer rendition of Nautilus' floating base. Canadian seafloor miner Nautilus Minerals (TSX:NUS) said Tuesday it has struck a deal with provider Gardline CGG, which will allow the company resume exploration around Solomon Islands, east of Papua New Guinea (PNG), where it is developing a gold, copper and silver underwater mine. The company’s CEO, Mike Johnston, said the goal is to expand Nautilus’ Seafloor Massive Sulphide prospect inventory by applying high tech exploration techniques the firm has been refining since 2006. Gardline CGG will supply a vessel, the MV Duke, equipped with a hull mounted Kongsberg EM302 multibeam system, a state of the art seafloor mapping system that provides some of the highest quality seafloor mapping data available, according to Nautilus. The deep sea miner settled a key dispute with the PNG’s government last year, and since then, progress has moved quickly on the Solwara 1 project. 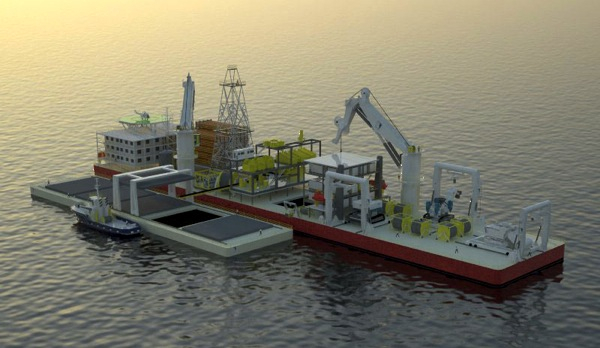 The company expects to have all its undersea mining tools ready to go by the middle of next year. It has also entered a charter agreement for a massive mining vessel, which it expects to receive in late 2017. After that, Nautilus expects to start digging up copper and precious metals almost right away.